To download and share free broadcast-quality content and VNRs from the event, click here(World Link for EBU Members) or here for shareable FEI YouTube content. Chasing down their 23rd European team Dressage title, Germany took a firm grip on the leaderboard at the halfway stage of the Grand Prix at the Longines FEI European Championships 2017 in Gothenburg (SWE) this evening. Helen Langehanenberg got them off to a great start when posting the biggest score of the day, 74.986%, with Damsey FRH, and team-mate Dorothee Schneider (48) cemented that when slotting into second place on a mark of 74.586 with Sammy Davis Jr. With two more riders still to go, including their superstar combination of Isabell Werth and Weihegold, the Germans have almost a six-point lead over their nearest rivals, the defending champions from The Netherlands. And it’s incredibly tight going into tomorrow’s second half of the competition with Denmark breathing down those Dutch necks just a fraction further behind, while the hosts from Sweden are in fourth place only another 1.0% adrift. A total of 16 teams are contesting the medal placings. Langehanenberg (35), who during her sensational career with the brilliant stallion Damon Hill was a member of the victorious German team at the Europeans in Herning (DEN) in 2013 and the silver medal winning Olympic team at London 2012, has a relatively new ride in Damsey FRH. Patrick van der Meer (46) and Zippo were the first Dutch partnership into the ring, scoring 71.114, and Diederik van Silfhout added a competitive 72.528 with Four Seasons to back that up. But van Silfhout’s Danish pupil Anna Zibrandtsen (23) and Arlando, the brilliant horse her Dutch tutor steered to team gold at the FEI European Championships in Aachen (GER) in 2015, produced a stunning performance to earn a mark of 72.957 which, when added to team-mate Agnete Kirk Thinggaard’s 70.629 with Jojo AZ ensured the Danes are right in the mix. Only the second German partnership of Dorothee Schneider and Sammy Davis Jr pinned Zibrandtsen back to third place when putting a mark of 74.585 on the board. Sweden’s Tinne Vilhelmson Silfven and Paridon Magi’s 72.857 filled fourth slot today. Austria, Spain, France, Russia, Finland and Belarus are lining up between fifth and 11th places as the action restarts tomorrow, but don’t discount the British yet. Down a man since Gareth Hughes withdrew Don Carissimo they could still be in with a shout according to Emile Faurie who steered another relative novice, the 12-year-old Lollipop, into sixth spot on a mark of 72.285. The Judges Panel for today’s Grand Prix at the Longines FEI European Dressage Championships 2017 consisted of: At K, Susie Hovenaars (AUS); At E, Annette Fransen Iacobaeus (SWE); At H, Isobel Wessels (GBR); At C, Evi Eisenhardt (GER); At M, Ann Gribbons (USA); At B, Francis Verbeek van Rooy (NED); At F, Hans Christian Mattiesen (DEN). Team Germany dominated these Championships for 40 years from 1995 to 2005. They won again at Herning (DEN) in 2013 and at the last edition, on their home ground in Aachen (GER) two years ago, they claimed bronze behind Great Britain in silver and The Netherlands in gold medal spot. 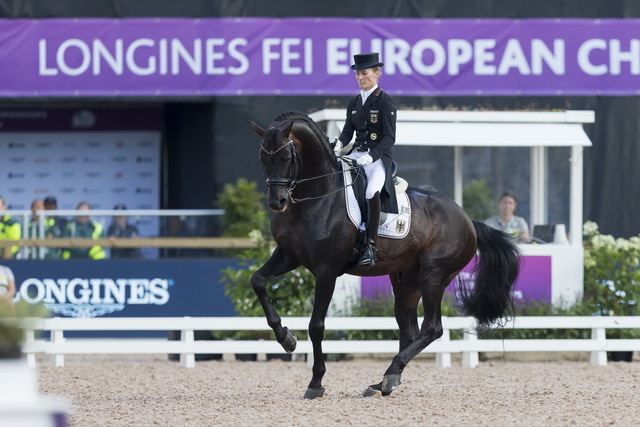 The inaugural FEI European Dressage Championships took place in 1963, and the team Championships were first staged in 1965 in Copenhagen (DEN). The top 30 horse-and-rider combinations from the Grand Prix qualify for the individual Grand Prix Special on Friday, following which the top-15 go through to Saturday’s individual Freestyle finale. 31 horse-and-rider combinations competed today and another 34 team members will ride tomorrow to decide the final team medal placings.